providing staff with information about how to avoid mosquito bites. Read more about preventing the spread of mosquito borne diseases. Under the Public Health Act 2005, all new rainwater tanks sold in Queensland must have suitable measures to prevent mosquitoes breeding in the tank. This involves ensuring every opening of the tank has flap valves or has mosquito-proof screens of brass, copper, aluminium or stainless steel gauze, with a mesh size of no more than 1mm aperture mesh. Drain sumps, inlet pits and storm water pits are all potential breeding sites that can produce extremely high numbers of mosquitoes when water pools in the bottom of the pit. 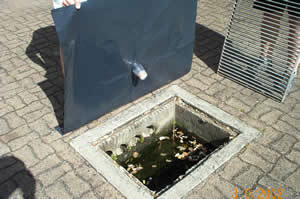 have pest controllers treat drain sumps during routine pest treatment. Drain sumps pose a particular threat as a likely breeding ground for dengue mosquitoes. In locations where dengue is common, such as northern Queensland, inlet pits can be without a sump and be self-draining. This is an amendment to the Australian/New Zealand Standards Plumbing and Drainage - Refer to the AS/NZS 3500.3:2003: Plumbing and Drainage-Storm water Drainage Section 5.3.3.6. Hotels and hostels are often the first place people go when arriving from overseas. This also means they are the first place someone arriving from a dengue affected country with dengue fever is likely to go. That is why it is extremely important dengue mosquitoes are not present on your premises. All it takes is one mosquito to bite an infected guest and it could pass dengue on to other guests, staff, and the wider community. Schools, universities and TAFE colleges can have lots of places for dengue mosquitoes to breed. With the number of people coming to and from campus each day a dengue mosquito carrying the virus can spread dengue fever very quickly, to many people. This is why it is essential that schools, universities and TAFE colleges check around their campus every week and remove or treat any containers capable of holding water and over the summer holiday period, consider using a residual insecticide to reduce dengue breeding. Roof guttering should be cleared of any debris before the break and again before school returns. Read more about preventing the spread of mosquito borne diseases like dengue. Read more about the dengue virus, fever and the dengue mosquito. Contact us for mosquito borne disease, and dengue specific advice and help.